The .txt file opens with textEdit by default, the .pdf opens with Adobe Reader and the .html file will open in Google Chrome. How can I find out this information from the command line? In particular, how can I find the icon of the default application for each of these files from the command line alone. There's a couple of tools you can use to analyze this situation. The structure is a little difficult to discern but you can look for strings such as .txt and take note of the lines occurring before it. To help us navigate this output, we can look in the Finder GUI for a type of file that we're interested in, for example a .txt file. Select it and then open up the info dialog about this particular file (⌘ + I). 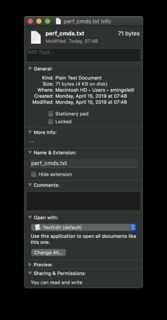 With the details such as the "Kind: Plain Text Document" and what application it's associated with to open it, "TextEdit" we can then look through lsregister output and see if we cannot correlate things a bit. For starters lets look for that "Kind: Plain Text Document". Above we can see that the icon for the default is this: Contents/Resources/document.icns. Where does Mac OS X store file association information? where /path/to/file is the path to any file. The script first determines the default application used to open the file, and then retrieves the application icon from inside the application bundle, returning its path. Not the answer you're looking for? Browse other questions tagged terminal finder filesystem . How to find “file-release” in OS X El Capitan 10.11.6?